This is a lovely non alcoholic option to have at a summer barbecue. If you wish you can use champagne or Prosecco for an alcoholic alternative. Place the strawberries, caster sugar, lemon juice and water into a medium sized saucepan and bring to a rapid boil. Reduce the heat, simmer for 3-4 minutes and then pass through a sieve squeezing well to extract as much puree as possible. When you have gathered all of the strawberry puree, transfer it to the fridge and allow to chill. 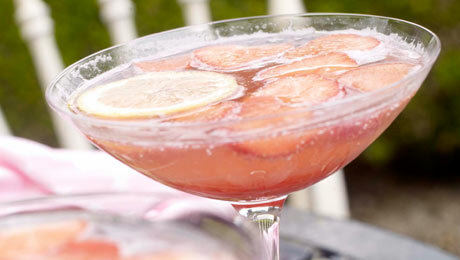 Put some crushed ice into a jug with the sliced strawberries and lemon. Pour on the chilled strawberry puree and top up with soda water.